TORONTO -- Maple Leafs head coach Mike Babcock is convinced adversity can be a good thing. His team is dealing with plenty of it at the moment. Toronto has sprung a massive leak defensively in losing three of its last four outings, surrendering a combined 23 goals in an ugly stretch that culminated with Saturday's embarrassing 6-2 road loss to last-place Ottawa. The Leafs have time to get things right before the playoffs, but with 10 games to go in the regular season, there's less and less room for error. "Adversity's really important for you in life," Babcock said after Monday's practice. "When you don't have any, you think you should get some so you can get better. When you get it, you don't want it. We have it right now. "Let's pull together, let's dig in, let's get better." Toronto focused on that during the team's first full on-ice session following a day off at home since the all-star break. Babcock was as vocal and demonstrative as he's been in recent weeks, with an emphasis on pressuring the opposition puck carrier, limiting time in the neutral zone and proper defensive positioning. The Leafs' busy schedule could be used an excuse for some of the bad habits that have crept into their game, but worrying trends that include a lack of attention to detail -- 21 of the 23 goals against came at 5 on 5 -- and a general disinterest at key moments need to be corrected soon. "As well as we can play offensively, and the firepower that we have, if we play that loose on defence it's tough to win," Toronto centre Auston Matthews said. 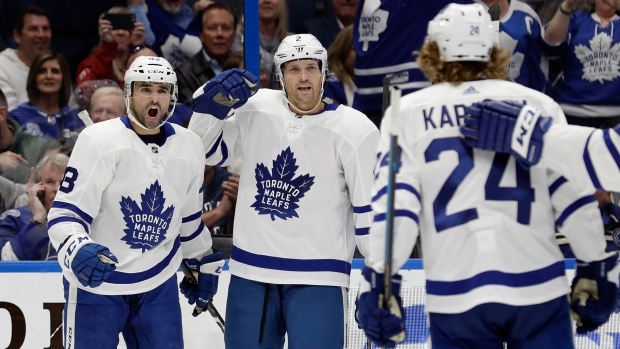 The Leafs trailed by at least three goals in every game last week, beginning with Monday's 6-2 loss to first-place Tampa Bay, a well-oiled machine that had little trouble shrugging off a Toronto team just back from a road trip through Western Canada. The Leafs then laid an egg against Chicago on Wednesday, falling behind 5-0 until a furious comeback fell short in a 5-4 setback. Toronto was down 5-2 to Philadelphia on Friday before rebounding with a wild 7-6 victory prior to Saturday's defeat in the nation's capital. No doubt a victim of some bad bounces, Leafs goalie Frederik Andersen allowed 14 goals on 62 shots, getting pulled in consecutive games for the first time in his career. Backup netminder Garret Sparks surrendered six goals on 44 shots against Ottawa. "Once we work our way out of it, we'll be better off," Andersen said. "You don't feel good doing it, but once you get out of it you're better off and hopefully learn some valuable lessons." Toronto (43-24-5) remains four points back of Boston (43-20-9) for second in the Atlantic Division and home-ice advantage in the first round of the playoffs with visits to Nashville on Tuesday and Buffalo on Wednesday up next. "There's a deep sense of belief in this room," said Leafs winger Connor Brown, who was sporting seven stitches over his right eye after taking a puck to the face against Philadelphia. "It's a bit of a lull. We don't feel like it's a reflection of our team. We've hit a bump in the road." While the emphasis Monday was righting defensive wrongs, there were also lighter moments that might not be expected from a struggling group. Smiles were flashed by the likes of Matthews, John Tavares and Morgan Rielly between drills, while Brown and his linemates celebrated more than usual following the completion of one particular sequence. "It's important to have fun," Brown said. "If we're coming to the rink hanging our heads -- moping -- we're not going to make plays and we're not going to get anything done." The Leafs are still without injured defencemen Jake Gardiner (back) and Travis Dermott (shoulder), and announced that fourth-line centre Frederik Gauthier will miss the next two games with a sore foot. However, winger Kasperi Kapanen practised for the first time since suffering a concussion March 9. "It's hard to describe the feeling you get," Kapanen, who has 19 goals and 23 assists in 68 games this season, said of the symptoms. "You're kind of off." Kapanen had been playing with Matthews and Andreas Johnsson, but skated alongside Nazem Kadri and Patrick Marleau. "The team's been struggling a little bit," Kapanen said. "When you let in that many goals, defensively something's wrong." Babcock was asked if there's an urge to recall 19-year-old blue-liner Rasmus Sandin, who has been lightning it up in the AHL, from the Toronto Marlies, but he quickly poured cold water on the notion the 29th overall pick in last June's draft will be on his way to the big club any time soon. "Let's not get in our way because we're feeling a little tension," Babcock said. "We've got good players here. Dig in and play good." That hasn't happened enough on the whole over the last 2 1/2 months for a team that had the NHL's second-best record (25-10-2) at Christmas, but is a pedestrian 19th since (18-14-3). "I don't know about you, but I'm way better when I know what the answer is," Babcock said of the defensive struggles. "If I know what the answer is, then I know I can fix it. "We talked about it, gave the solution. Now we've got to solve the problem."